Two tapes have surfaced in recent days. Thereby hangs a modern tale of the “best of times and the worst of times”. It is a bit of a stretch to use Charles Dickens to link the best of times represented by John Kerry, and the worst of times, embodied in the owner of an American professional basketball team. But stretch is required in a world gone awry with both power and money much more than usual in the wrong hands. Hence, we have a tale of two tapes. Tape number one is getting considerable media play because it involves the racist ravings of the owner of the Los Angeles Clippers, one of the better teams in the National Basketball Association. Tape number two draws less attention, of course, but it happens to be of far greater significance, because it reveals U.S. Secretary of State John Kerry telling a group that Israel is in danger of heading toward international isolation as an apartheid state. Al Jazeera reported Kerry’s reference to the threat of apartheid looming in Israel’s future. US Secretary of State John Kerry has said that Israel risks becoming “an apartheid state” if there is no two-state solution to the Israeli-Palestinian conflict. Kerry’s comments were published on Sunday by The Daily Beast news website, which obtained a recording of his remarks on Friday to the Trilateral Commission, a non-governmental organisation which includes senior officials and experts from the US, Western Europe, Russia and Japan. Israel supporters who are deeply embedded in the U.S. government and its Israel Lobby satellites, reacted immediately to Kerry’s use of the word “apartheid”. The attack on Kerry was predictable, lamentable, and further proof that Zionism rules our land in this the worst of our times. Kerry, alas, was forced to walk the plank for his team, issuing a statement that he wishes he could rewind the tape and use a different word. Tape number two captures the ugly face of racism in a different arena. It is drawing considerable media attention this week during the first round of the NBA playoffs. Professional sports in the U.S. has increasingly emerged as a corporate enterprise in which millionaires play games to entertain millions for the benefit of billionaires. One of the owners in the National Basketball Association was caught on tape recently talking to a young female friend. Sports Illustrated.com reports that the NBA “is investigating an audio recording in which [Los Angeles] Clippers owner Donald Sterling can allegedly be heard making a series of racist remarks to his girlfriend”. “scolding V. Stiviano, his girlfriend, for bringing African-Americans to Clippers games and for posting photos of herself and African-Americans to her Instagram account. TMZ posted excerpts of the audio conversation in which Sterling, who is married, is allegedly upset with Stiviano — who identifies herself as “black and Mexican” — for posting a photo with Hall of Famer Magic Johnson. The Clippers team, composed primarily of African American players, protested against their owner’s racist rant Sunday night by wearing their warm-ups inside out. The National Basketball Association has banned Sterling “for life”, for his racist remarks. It will also fine him $2.5 million and push to have him sell the Clippers. Click here for the AP story. These two tapes provide remarks which were not intended for public consumption. Each tape, however, speaks of racism from different ends of the international racist divide. In Kerry’s remarks there is the overt warning that apartheid looms for Israel, a future status that Israel vigorously refuses to acknowledge, hiding behind a wall of deceit and oppression. In the case of Clippers’ owner Donald Sterling, his racism is blatant and open in private conversation, employing words that reveal him to be indifferent to the inherent racism in what he says to his African American/Mexican female friend. The investigation by the NBA league owners has lead to the league seeking to force Sterling to sell his team. One report says former Los Angeles star Magic Johnson has indicated his willingness to consider buying the team. Johnson denied the story. Mr. Sterling was also sued unsuccessfully over accusations of racial discrimination by the Clippers’ former longtime general manager, Elgin Baylor. The second tape in this “best of times, worst of times” scenario, involved remarks from John Kerry to the Trilateral Commission, an international organization which provides a forum for world leaders to speak among themselves. 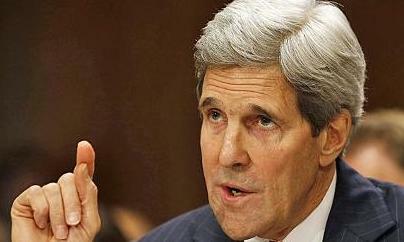 This time, Kerry’s remarks did not stay in-house, but were shared with the world. As it turns out, this was a fortuitous sharing, evoking the usual Israeli and American Zionist outrage at the sound of an American Secretary of State using the dreaded A-word (apartheid). The deadline Kerry initially set for finding a framework for the Israelis and Palestinians to follow in future months arrived Tuesday, April 29. No framework has been found, for which each side blames the other. Blame, however, is not the issue. Apartheid and occupation are the two major issues that will continue to haunt both sides in the post-April 29 period. And blame for those issues, as John Kerry makes clear, rests with Israel. Meanwhile, Israel tightens the screws on its occupation enforcement, while the Palestinians prepare to join United Nations agencies that will introduce the UN to the mix as an even more significant player in the future. Thus ends this “tale of two tapes”, a tale which features two Americans, John Kerry, the first U.S. Secretary of State to employ the term “apartheid” while still in office, and Donald Sterling, who emerged as this week’s American poster boy for racial bigotry. The picture of John Kerry above, is from Al Jazeera. 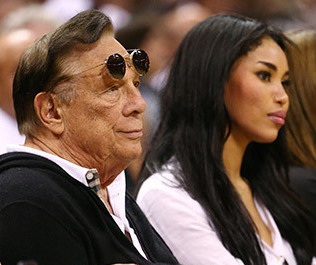 The picture of Clippers’ owner Donald Sterling, is from Getty Images/Sports. It appeared in Sports Illustrated.com. This entry was posted in John Kerry, Middle East, Middle East Politics, Television. Bookmark the permalink. Thanks, Jim, for a great article. Kerry’s words were appropriate and timely. Israeli apartheid is here and now, not something that “might’ happen in future, if conditions continue to escalate. However, Israel is content, as long as, criticism remains verbal and rhetorical, and Congress remains in its back pocket, and the White House remains spineless, and aid money keeps on rolling.. Israel can continue to hold on, by building/expanding settlements, demolishing Palestinian homes, and maintaining its hideous occupation..
Like all other tyrannical powers, nothing will change it before shock waves snap it off its decadent bath tub of serenity and contentment. The Israel-Palestine aspect of the article is, as always, spot on and well presented. “Bravo”, Jim and “Thank you Mr. Secretary. As for Donald Sterling, he will be dealt with by his peers, and he’ll certainly be drummed out of The Club. But lets face it, it won’t happen for WHAT he said or for his racist core. His unforgivable sin is to have been caught in the act – on tape – thus having brought discredit onto the NBA. Here is another tape – the one catching Netanyahu unknowingly back in 2001, talking to an Israeli settler family. He speaks of the easy manipulation of American presidents and of his sabotaging the Oslo Accords. Why this has not been more widely circulated I don’t know. Is there a question of authenticity? I was hoping to find a transcript, but couldn’t. I did provide a link that had the audio somewhat audible. Perhaps a Hebrew speaker reading this post can confirm the translation. Watch in particular starting around timeline point 1:10. Around 1:25 he talks about America being easy to manipulate. Later talks about how he broke the Oslo Accords. Why can’t the world be made to see what a duplicitous person he is and how disrespectful of America that he is? All the while he gets 29 standing ovations when he appeared before Congress and gets called America’s greatest friend and ally (even I believe by Obama). Plus the billions of dollars and diplomatic cover in the UN. Israeli hasbara has been scarily successful in creating a perceived universe quite detached from reality. Is there some way we can disseminate this video more widely? To expose the manipulation and distortion? It shows clear as a bell why the occupation has gone on so long and why peace talks have been a charade. The lack of a resolution has created and inflamed enemies and made us and the world less secure. The US an honest broker? No, a manipulated broker. We can be safer and we can be better. Goals to aspire to.